On Sunday, March 4, 2019, YANA Texas Chapters leaders Jennifer Wester ‘16 (Dallas) and Rachel Littman ‘91 (Houston) travelled to Plano, TX to join the Texas Muslim Women’s Foundation (TMWF) International Women’s Day Luncheon. More than a welcoming, celebratory event, the luncheon educated attendees on the social services needs of the community, the progress they have made over the years assisting and empowering primarily Middle Eastern refugee women victims of domestic violence, and the ways a community can cross ideological, faith, age, and gender divisions to come together for the common good. Most impressive was the presentation made by guest speaker Dr. Azizah Y. al-Hibri, Esq., Founder of KARAMAH: Muslim Women Lawyers for Human Rights and professor emerita at the T.C. Williams School of Law at the University of Richmond. Dr. al-Hibri spoke beautifully and clearly as she walked the audience through a textual analysis of sections of the Qu’ran and related Hadiths, taken from her most recently written scholarly articles on Islamic Law. 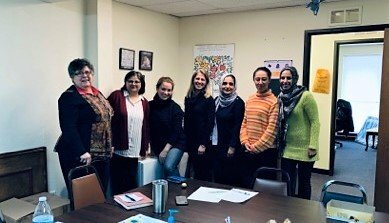 The following day, Jennifer and Rachel met with the TMWF staff for a roundtable discussion on sharing ideas, learning from each other, and brainstorming ways YANA, TMWF and their respective networks could work with each other to connect people and improve lives. Following a lively discussion, a staff member kindly escorted the pair to a beautiful and powerful photography exhibit presented by the Foundation’s Islamic Art Revival Series called THE HUMAN EXPERIENCE 2019: Connecting Worlds, in partnership with Keller Public Arts and the City of Keller, TX. Texas Muslim Women’s Foundation staff is incredibly energetic, professional, and eager to share their work. The organization is a model of nonprofit best practices, from their Board composition and engagement, to their direct services, to their fundraising and financials. The collaborative meeting generated lists of people to put in touch with each other, books of Islamic art to assist with Jennifer’s art education programs, and a keen desire to cross promote each other’s work. The YANA-TMWF partnership is already growing. Texas Muslim Women’s Foundation recently posted summer internship positions with the Yale Office of Career Strategy and connected with Yale student Ben Weiss ‘20, co-founder and co-executive director of Havenly, a New Haven-based bakery collaboratively run by Yale students and local refugee chefs. The warmth, humor, professionalism and total dedication of the women at Texas Muslim Women’s Foundation is hard to capture on paper. Please visit their website, contact them if you have ideas on program or event partnerships, and consider making a trip to Northern Dallas to visit them if you are ever in the area. YANA and the world are stronger and better for having Texas Muslim Women’s Foundation in our community.